It's time to move the project forward with Steam Direct instead! New demos will still be coming as the game continues to take shape, and you can expect to see the final version available by December. Hope to deliver this game to all of you real soon! A new post on the official dev blog breaks down exactly what's changed and will change to make sure there is no reason for a C&D order to be issued to Battle Gem Ponies. Addressing the concerns with art, names, and gameplay in hopes of putting those worries to rest. Meet your very own super-powered, shape-shifting pony and embark on a journey to become the Pinto region’s next Prime Champion! This is a turn-based RPG adventure featuring cute companions, captivating action, strategic combat, virtually no grinding, and surprisingly few horse puns. Being developed by just one Tony Yotes puts a harsh limit on the scope of things, but any additions and alterations within a recent graduate's ability can be placed on the development schedule. The goal here is to make the best pony collecting RPG there is, after all. Having a few bad ideas thrown out or redesigned will only benefit the game in the end. So regarding the dev schedule, the features listed below explain what's currently planned for the final release. Every single pony and attack is uniquely animated to bring these pixel art battles to life! An enormous, vibrant region awaits! Travel through deserts, mountains, forests, graveyards, and underwater temples on your quest through the Pinto region. Form a powerful bond with your shapeshifting pony companion and watch it grow stronger, learn awesome new moves, and take on the toughest of enemies. Surf across oceans and lakes with swift-swimming ponies. Teleport to the nearest Health Center whenever you like with a simple phone call. You can even relax for a few seconds and see how your pony friend is feeling about your current location and situation. 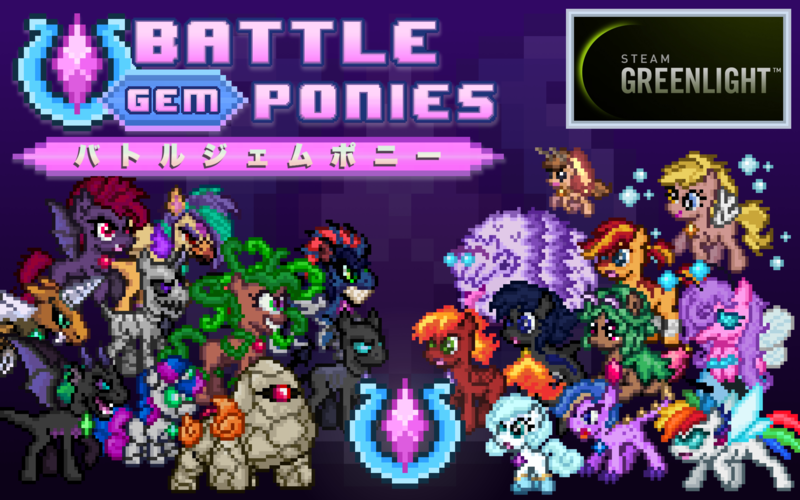 Choose who you take into battle from a selection of 60 Ponies and their Ultra Forms. You can alter their moves, stats, and equipment to become an unbeatable trainer! Using attacks assigned to your pony's Light, Heavy, Status, and Tutor slots makes you think more carefully about which moves to take into battle. Special versions of wild ponies roam the map, and these alpha ponies are far stronger than the ones that lurk in the grass. Each one will have a special interaction with you before your one and only chance to capture their powers for yourself! Can't expect everyone you fight to be a pushover. You’ll have your skills tested by expert Mavens and fight for your life against the evil Paragon Cartel. And if you find those too easy, you can always try the much more challenging Oatmeal Mode where your fallen ponies don't come back. Expect Weekly DevLogs and Monthly Updates as the project comes together. Aiming to release to mobile and PC platforms by August 2017.
so...this game won't be put up since greenlight is shutting down? If so i'm going to be annoyed, really wanted to play the full game. Like TF2 and Fire Emblem, Pokémon was the first to put this mod of elements in battle. We can't say it's a rip-off. Totally not a Pokemon rip-off. Good bye Green Light And welcome steam direct. The game may have lost it's chance to get on Steam via Greenlight, I'll be trying again with Steam Direct once the game is actually complete later this year. Even so, this game is a fault line with the whole legal matter still being a concern, and Valve probably noticed it a while ago. However, I would be more than happy to be proven wrong on the entire thing and play this game in the future, but I have high doubts that'll ever happen. Come now, if you haven't seen that I was here to pick on a meaningless fight on that part, then what else is there? Sure, it "might" have a "lower possibility" of making it. Even if you're right about both, there is still a chance. There's no need to mourn the loss of it before Valve actually responds. Also, ending your sentence by calling someone a kid or a child doesn't strengthen your argument it makes you look condecending and/or silly depending on the actual age of who you're talking to, and rude regardless.